Latha math! (That's "hello" in Scottish Gaelic.) Foreign language is one of those subjects I have not taught consistently. I've had the best of intentions to start teaching my children Latin and French, and it's never quite happened. We've done a little Spanish, but nothing for long. 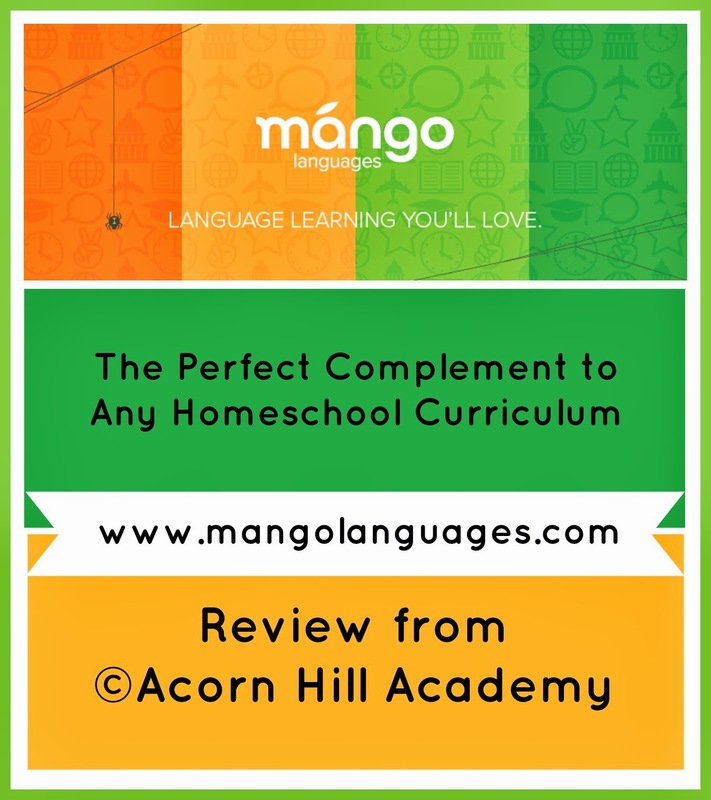 I have avoided online foreign language programs, because I would prefer to keep us off the computer as much as possible, but I just had to give Mango Homeschool Edition from Mango Languages a try. For the purpose of this review, I received a one-year subscription for three students. I signed up my daughters and myself, and we began European French. The program is intended for children ages 6 and up, even adults. They offer all levels of coursework, which makes them a great option for any grade level, but particularly for those of us trying to figure out how to homeschool high school. Because it's browser-based, it works on both Apple computers and PCs. We decided to make our French lessons part of our morning time, and did the program together orally. My girls and I had a little competition going to see who could remember things first as we went through the lessons. We had a LOT of fun. Even my 6 year old joined in and learned along with us. He frequently comes up to me and says things like, "Mom, I know how to say 'â bientôt!' It means 'see you later!'" I am impressed by what he's picked up, because honestly, he's not all that interested in sitting still and participating with us most of the time. He's usually playing with blocks or trucks while we are speaking French to each other, although he will sometimes say things along with us. There is no written component to this program, but European French does come with a Course Guide for each of the three levels. I printed those, and have had my girls copying out the sentences as we learn them, so they see how the words are spelled and become familiar with the sentence structure. It makes good copywork for them. While we chose to work on French together, Mango's language programs are structured so that students are able to work independently. A few times, when we got started later than usual, I sent the girls to do their school work and asked them to do French on their own. They were able to do it with no problems at all. I also took a look at Scottish Gaelic. I didn't have as much time to spend on this as I'd hoped, but it was still fun. I've always wanted to learn Gaelic. At this time, there is only one level of Gaelic available, but that's a lot more than I know right now! I like the way the program works. I wasn't sure, at first, because it's completely different from the way I learned French. However, right from the beginning, students learn things like formal vs. familiar methods of addressing other people, and how to construct simple sentences. You don't sit down and conjugate verbs, but you learn the different verb forms as you listen and respond in the lesson conversations. It's a more natural method of language learning, I think, than sitting down with a textbook, even when there is audio available. The phrases we learned initially were greetings, so we can have simple conversations with each other. It's a great way to practice. What did my girls think? They both enjoyed using the program. They both thought a written component would be helpful. My oldest daughter has spent the most time writing the phrases we learned into a notebook, and she said it helped her a lot. We reviewed what you might call the "beta" version of Mango's Homeschool Edition. They offer more than 60 different languages! The lessons are all recorded by native speakers, which makes such a difference in language learning. There is phonetic spelling available on demand, so you can see how it's pronounced in phonetic spelling like you'd see in a dictionary. That's extremely helpful. Sometimes I had a hard time hearing, thanks to years of college marching band, so the phonetic spelling gave me some much-needed hints. Along with conversation and grammar, there are cultural insights, customs and etiquette. One particularly nice feature is the voice comparison tool. It allows you to speak into a microphone and see how your accent compares to the native speaker's. We learned that we do need a separate microphone for that; our computer's microphone didn't pick up enough. You may have seen Mango Languages at your local library. That's where they started, and they've grown from there. At the library, you may not have access to all the languages Mango offers, and only one level is available for any language through the library system. The homeschool version has all languages and levels, and the community feature, which isn't available through the library. Additionally, over the next few months, they plan to add lots of new features, like enhanced tracking and progress monitoring, including seat time, for students and parents; goals and personal lesson plans (both stand-alone and tied into Mango courses), and a resume and portfolio builder. Overall, I'm not sure I would use this program on its own, but it's a perfect complement to go along with any curriculum. 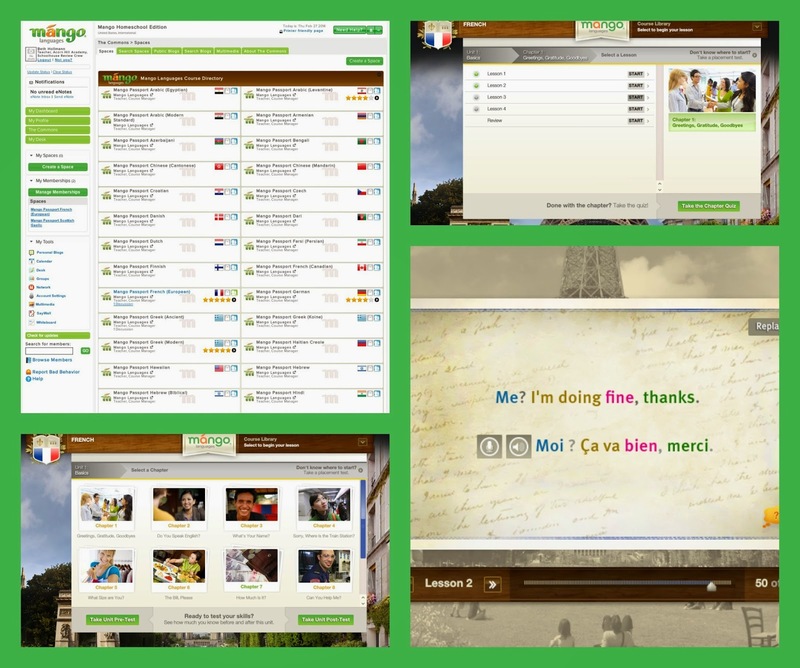 You have access to as many languages as you want to try. I am fascinated with languages (I majored in linguistics in college) so I feel like a kid in a candy store when I look at all the languages I could explore with Mango. They have Ancient Greek! Ancient Hebrew! Pirate! (Yes, Pirate!) Malayalam! I don't even know what Malayalam is, but now I want to learn. I love the idea of a language-learning community, where you can ask questions and talk to others learning the same languages. Obviously, there are significant savings when you sign up for a year rather than making monthly payments. I hope you'll take a look! Connect with Mango on Twitter, Pinterest and Facebook!